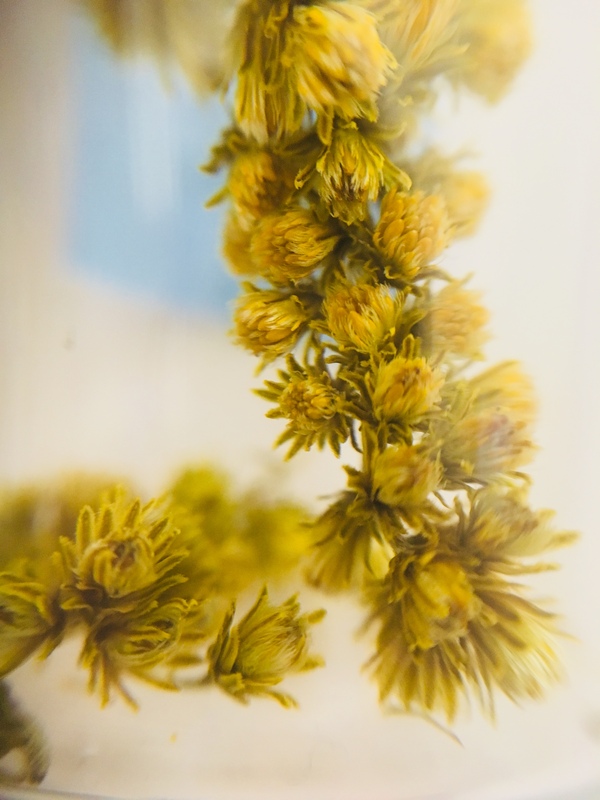 Goldenrod plants feature large in the Aurelia project, acting in multiple capacities: Goldenrod has been central to Brittany Hill’s thesis research since May, towards this project and towards both scientific and artistic outputs. Brittany spent her summer months tending to the plants, grown in soils from contaminated gold mine tailings sites (as well as controls grown in regular soil). She has been studying the phytoremediation capacity of goldenrod, their capacity for uptake of toxins from the contaminated soil samples, into their stalky green bodies and mini-lion head florets. She also collected and vacuum-sealed its florets in mass quantities for our use for natural dyeing. We spent the day today scouring a soft bundle of wool yarn, and prepping a dye pot with the preserved flowers. Brittany had done a few initial experiments with the goldenrod over the summer, but as we went through the process, I shared with her a few best practices, rooted in science and craft, for working with protein fibres and obtaining an even colour. The dyed yarn we will have to play with in the end, however, is ultimately not the most important lesson of the day. What I actively meant to mentor for Brittany during our dye session was research-creation. In this activity, we had much success. Research-creation is a very specific process of thinking through materials. It is a process of engaging one part of the brain, which is activated during “hands-on” work, in order to release thinking solely from the logic part of the brain. This, towards creative thinking, which is slightly less linear and more abstract. So, while Brittany and I timed the steps of the physical process of dyeing, monitoring the hot plate and measuring ratios of vinegar to water, we discussed new ideas for the project that fomented along with the bubbling of the dye pot. These conversations, facilitated by the need to patiently wait out slow processes and material transformations, push the project deeper into its conceptual development and possible forms. The conversations are not simply about these things, but about a variety of relevant life experiences that inform these things. Some of our conversation revolved around concepts that I have been sitting with in my own work, such as the (necessary) co-existence of empathy and violence in the instrumentalization of microorganisms or other living systems in bioart/ research. Brittany shared with me a story about a childhood experience of her grandfather leaving tobacco offerings at the base of a tree before taking her out fishing – a give and take ritual, to both honour and respect the spirit of living things while also taking life. We discussed the agency of microbes in both our bioremediation activities as well as in creating a visual work that can effectively communicate the behavior of these “participants”. It was through such circular conversations (stir the pot, turn over the wool, poke it down) that we came up with an excellent new idea for the engagement with, display and dissemination of the work we will do together, one that Brittany can tend to and care for over a longer period of time after my residency concludes. In this way, the yarn and the goldenrod that has dyed it, are channels for research-creation and new forms of information. They are vessels holding deeper questions, objects or bodies beyond themselves, secret/become sacred materials, not quite symbolic but certainly significant, even if only to the creators. They will become mnemonic devices, carrying a multi-vocal story of scarred land, healing medicine, poetic gestures, microbial actors, empathy/violence, ethics, care and futility.